Do you remember the roasted rhubarb from Monday? All the combinations imaginable with strawberries? Wanna play some more? If the last post didn't convince you, I hope these pictures will have you running to your grocery store! Now, they may seem complicated, because of the 3 different layers. But they're all based on the same thing, so all you have to do is whip some cream, puree some strawberries, get some more roasted rhubarb (because you've already eaten the previous batch, right? ), and you've already done almost all the work! 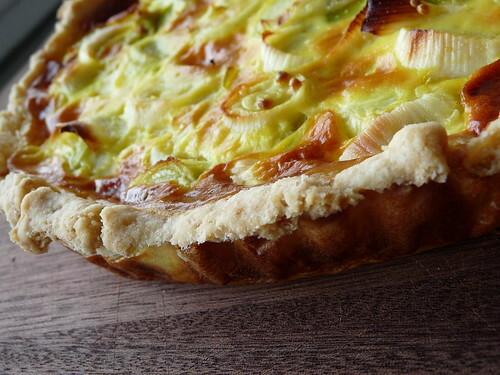 Note : You won't need all the rhubarb for the dessert, it's the same recipe than in the previous post. Cut the rhubarb into 2 inch strips. Toss the rhubarb with the sugar in a baking pan. Bake at 375F for 15 to 20 minutes (until it is soft). 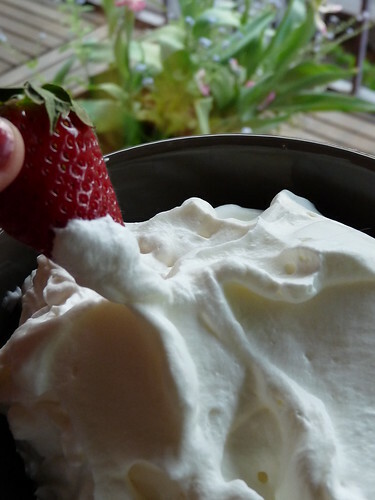 Whip the heavy cream to soft peaks with one teaspoon sugar. Puree 7 oz. strawberries and cut the rest into small dices. In a small bowl, sprinkle 2 tsp gelatin over 2 tablespoons of water, and let it sit while you make the rest of the mousse. 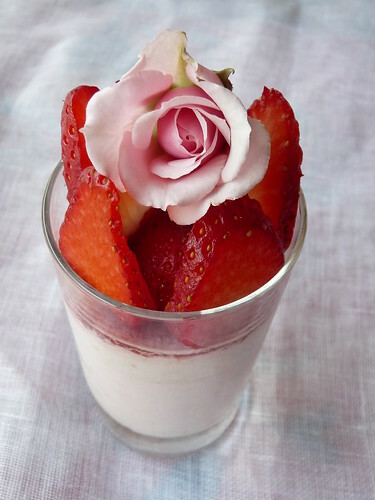 Combine the remaining sugar, the fromage blanc and half of the strawberry puree. Melt the gelatin in the microwave for 20 seconds and add it to the mousse. Fold in 3.5 oz. whipped cream, then the strawberry dices. Pour the mousse in little glasses or jars and let sit 30 minutes in the fridge. In a small bowl, sprinkle 1/2 tsp gelatin over 1 tsp of water. Melt the gelatin in the microwave and add it the to remaining strawberry puree. Pour a layer over the first mousse in each glass and refrigerate. Rappel : j'avais fait la rhubarbe rôtie précédemment, tout n'est pas nécessaire pour les verrines. Nettoyez la rhubarbe sous l'eau, et coupez-là en tronçons de 4 cm. Disposez-là dans un plat et saupoudrez de sucre. Enfournez pour 15 à 20 minutes, jusqu'à ce qu'elle soit tendre. Battre la crème en chantilly avec 5g de sucre (une cuillère à café). Réduisez 200g de fraises en purée et découpez en morceaux les fraises restantes. Faites tremper 2 feuilles de gélatine dans un bol d'eau froide pendant que vous préparez le reste de la mousse. Mélangez le fromage blanc, 100g de purée de fraise et 20g de sucre. Egouttez la gélatine et faites la dissoudre au micro-onde pendant 20 secondes avant de l'ajouter au mélange. Incorporez ensuite 110g de chantilly puis les cubes de fraises, et versez dans vos verrines. Laissez prendre au frigo pendant 30 minutes. Faites tremper la demi feuille de gélatine dans un bol d'eau froide. Egouttez-la et faites la dissoudre au micro-onde pendant 10 secondes avant de l'incorporer à la purée de fraise restante. Versez la dans les verrines au dessus de la mousse de fromage blanc. Laissez prendre cette gelée au réfrigérateur pendant 15 minutes. Mélangez la rhubarbe avec les 50g de chantilly restante, et repartissez la dans les verrines. Décorez de fraises ou d'un macaron. 2- Unfortunately, I take time to cook, to take pictures, even to write down the ingredients (big improvement already!!! ), but not to write the entire recipe to give it to you. Confession : I always plan more things than I have time to do, and because the recipe writing isn't on top, it always get squeezed. And that I need to change, my friends! 3- My "To post" file isn't helping : the longer a recipe stays in, the less likely it will eventually come out of it. No matter how enthusiastic I was about it. Even if I only did it for you. Maybe it works like in The Neverending Story. Maybe we should blame the Nothing, and my lack of confidence in this. So, let's break the spell and start with some very seasonal produces. 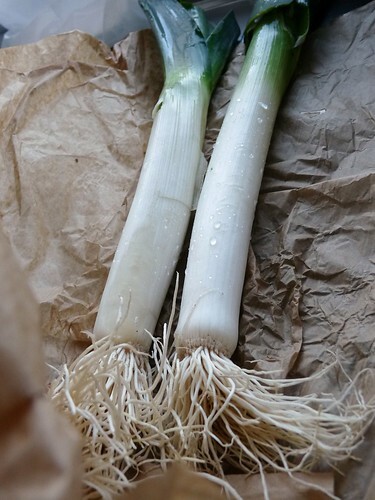 Don't you love going to the farmers market and seeing everywhere little proofs of spring? The vibrant colours of fresh radishes, the small and tender carrots with their abundant green top. The wonderful smell of lilacs at the flower shop. And of course, the first sight of the rhubarb pinkish stalks. Even the grey sky did not stand a chance against those evidences! First, I roasted the rhubarb. You won't need everything for the little cakes, but I'm sure you'll be just like me, and you will find plenty of uses for it. 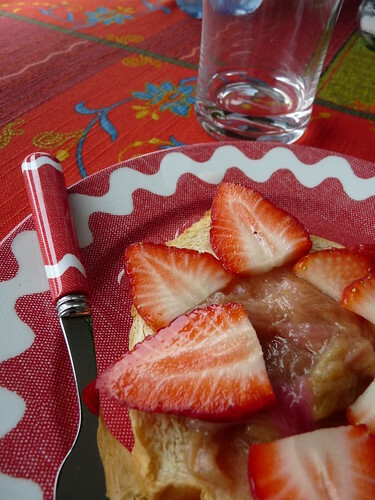 For example, you could lightly toast a slice of brioche in your oven, and top it with some of the rhubarb and fresh slices of strawberries. Mmm, the buttery taste of the brioche against the delicate acidity and sweetness of the fruits? Please, try this, because it's just too delicious not to be experienced. Or you could add it to your favourite yogurt (along with some strawberries dices!). I know this is what I'll have tomorrow for lunch, and I just can't wait! So you see, this "accord "works so well that you can play it with any variation. 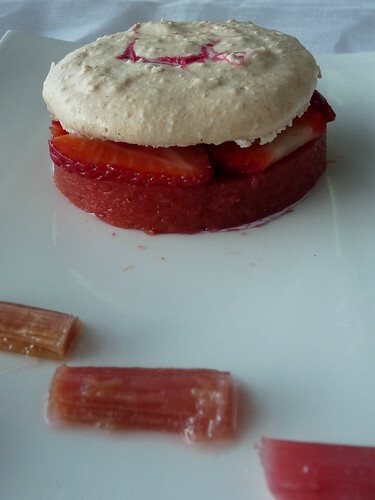 I choose to directly mix the roasted rhubarb with some strawberry puree, to obtain a delicately sweet jelly as a base. To add some texture to it, a vanilla bean macaron seems a good idea, doesn't it? Note : the recipe indicated 1 cup powdered sugar, but this was overly sweet. I would recommend only using 3/4 cup. In a large bowl, sift together almond flour and confectioner sugar. Beat whites in mixer at medium speed until they form soft peaks. Add regular sugar gradually, and continue beating at high speed just until whites are thickened and form stiff peaks. Sprinkle dry ingredients and vanilla over whites and fold in with a rubber spatula gently but thoroughly. Place the mass in a pastry bag and pipe 3.5 inch rounds on the sheetpan lined with parchment paper. Let them dry at room temperature for an hour. Bake for 15 to 20 minutes, depending on the size of the macaron (20 minutes for a 3.5 inch macaron). 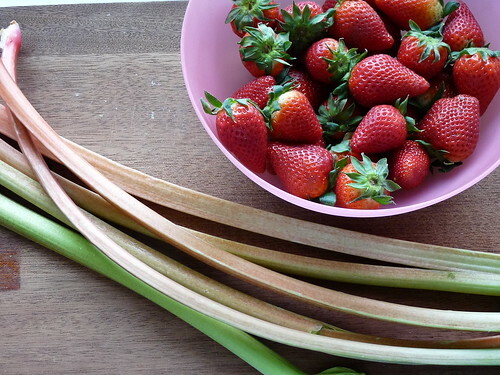 Puree the strawberries, the rhubarb and the sugar together. Melt the gelatin in the microwave for 20 seconds and mix with 2 teaspoons fruit puree before adding everything. Pour into four 3.5-inch rounds and let in the fridge for one hour. 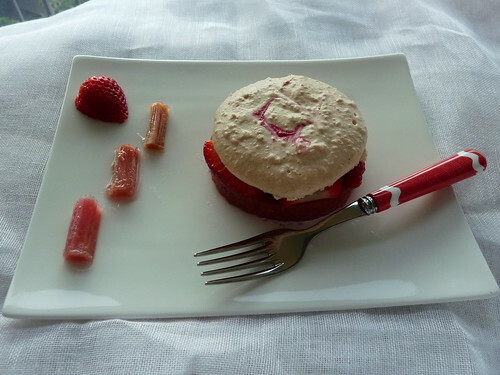 Once the jelly is set, unmold, top with slices of the 6 strawberries and with the macarons. Note : La recette indiquait 110g de sucre glace, mais j'ai trouvé le résultat beaucoup trop sucré. La prochaine fois, j'essaierai avec 75g. Dans un bol, mélangez la poudre d'amande et le sucre glace tamisé. A l’aide d’un batteur électrique, fouettez les blancs pour les rendre mousseux. Incorporez alors le sucre en poudre au fur et à mesure, tout en continuant de battre, puis en augmentant la vitesse. Vous devez obtenir un mélange ferme et brillant. 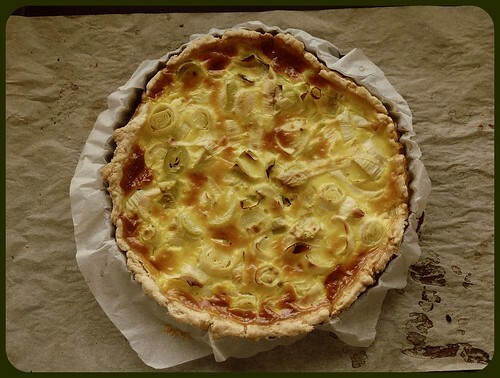 Ajoutez alors la totalité du mélange d'amandes et les graines de vanille, et incorporez les doucement à l’aide d’une cuillère en bois ou d’une maryse. Dressez à la poche à douille sur une plaque de papier sulfurisé et laissez sécher à température ambiante pendant 1 heure (on dit de laisser croûter). Préchauffez le four à 150° et faites cuire 12 à 20 minutes selon la taille des macarons (20mn pour un macaron de 9 cm de diamètre). 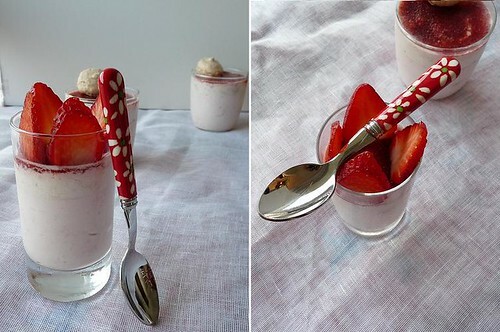 Mixez les fraises, la rhubarbe et le sucre dans un hachoir. Faites ramollir les 2 feuilles de gélatine dans un bol d’eau froide. Egouttez-les, et faites-les chauffer (soit 20 secondes au micro-onde, soit dissoutes dans une cuillère à soupe d’eau bouillante). Mélangez avec 2 cuillères de purée de fruit, puis mélangez tout ensemble. Coulez la préparation dans 4 cercles de 9 cm de diamètre, et faites prendre au réfrigérateur. 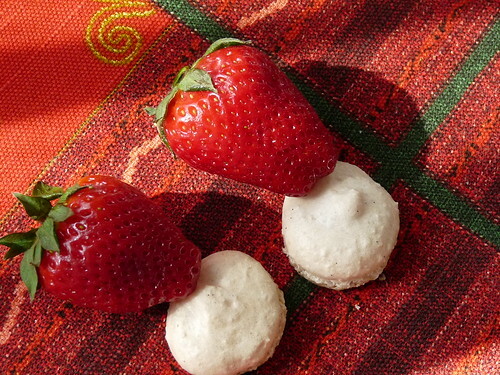 Une fois la gelée prise, démoulez, garnissez de tranches de fraises et surmontez le tout d'un macaron.